Many of us residing in the Western part of Europe take a lot of things that our country's EU membership is offering us for granted. Our generation does not remember border controls, visas, check-points and long queues at the borders. We are used to jump on a car, plane, train, bus or caravan and drive through our continent effortlessly and hassle-free. We can literally visit one country and if we get bored, we can rent a car or get on a bus and go on a daily city break for a shopping spree across the border, to another town of a neighbouring country. We forget that it wasn't always like this and that not everyone in Europe can enjoy such privilege. While I was travelling from Ireland to my native Greece this summer, I thought to make a stop over to Bulgaria and experience all that it has to offer. After four days travelling through the country, I and my partner decided to leave the city of Plovdiv and head to my hometown of Thessaloniki in Greece. I have totally forgotten that Bulgaria is still not a Schengen member state, but I was not prepared for what I was about to experience. We could only get to Greece through the check point of Promachonas, a small town in the Greek-Bulgarian borders. Under the scorching heat, one could see long queues of cars, buses and trucks, all waiting to pass through the border controls. 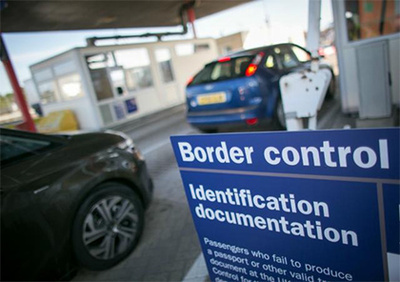 Drivers of cars had to show their passports at the check-points, while truck drivers had to pull aside, show their ID, vehicle registration and licence, while in addition they had to allow a search in their cargo, just in case they were hiding any illegal immigrants. The same procedure applied for passenger and tourist buses. We had to drive aside and pull over, present our passports or ID to the Greek officers, while the non-EU passengers had to hand over their documents for inspection and to be stamped. Meanwhile the luggage compartment had to be opened, to be checked for any illegal migrants. All this took around 20-30 minutes, something that I was unaware that it still exists. As I am a frequent traveller within the Schengen Area, I am used to be reminded when I change countries by the sound of my mobile phone, welcoming me to the new country. Having to wait in a long queue to enter a country felt so alien. One would think how these countries can experience the full benefits of EU membership, if they cannot enjoy free movement. In other parts of Europe, roads and railways have been fixed and modernized, because there is no need to check everyone that crosses through. Goods take shorter time to be delivered, while people can go shopping frequently and effortlessly across the border, boosting trade between the countries. In the Balkans this is yet unimaginable. The roads and railways still need to be upgraded, but with so many restrictions this development lags behind. As result, the whole region loses out in tourism, trade and infrastructure modernization, hindering economic development, something that this region desperate needs. And not just Bulgaria or Romania but Greece too, which has long been held back by keeping the Balkans outside the EU and countries such Bulgaria and Romania outside of the Schengen. Their application has been ongoing, and their accession postponed- or rather blocked, by the fear of other EU member states such as Finland, the Netherlands and Germany about the impact it could have on immigration. Although Bulgaria and Romania have been working hard to meet the criteria, the refugee crisis and the rise of xenophobia in Europe has stopped them from joining the free movement area. As an excuse, the EU council members that opposed their accession claimed that there are corruption concerns and the ability of the Bulgarian or Romanian authorities to deal with the problem. While partially their concerns are justified, they forget that the more a region remains poor, the easier it is for corruption to settle and prevail. The only way to tackle this issue is direct investments, rise of the living standards, education, economic stability and prosperity that will lead to the gradual abandonment of old ways and practices. But for all the above to be achieved by these two countries, they need the support of the EU and to be treated as equal members, allowing them to access their full potential by becoming admitted to all of the block's agreements. We cannot let the internal social or political struggles and insecurities of other member states on immigration, to hold back the member states that need our support the most. On our way back from Greece to Ireland, we flew through an EU member in another type of transitional crisis. We had to get two flights that were not interconnected from Thessaloniki to Dublin, via Manchester in the United Kingdom. We carried two cabin and one dispatched bag that we had checked in at Thessaloniki airport. As we got few bottles of wine from Greece and since our flights were not interconnected, we decided to get out of the arrivals in Manchester, collect our bag then place the bottles in it, before dispatching it again with our flight to Dublin, pass again through security and get the plane home. We have done this so many times before in our travels, since I am a Greek/EU citizen and my partner is Brazilian with a permanent visa for all EU member states, as he works and resides legally in Ireland and is married to an EU national. We have never been stopped, not even in Istanbul airport when we had to stay overnight in a hotel, nor during our trip from Croatia to Bosnia and Herzegovina, a non-EU member. We have visited the United Kingdom two years ago and there was no problem with his passport or his visa, he has the right to travel in the country, with no restrictions. However, upon our arrival at Manchester airport, my partner went through the non-EU passport holder check-points, while I continued through the EU national ones. I collected our bag, but my partner was very late, and I started getting worried as we had a limited amount of time to catch our next flight. The airport's security staff had decided or got the orders, not to allow any non-EU passengers coming from Greece traveling through the UK outside the arrivals. The excuse they gave him was that he had only about an hour until his next flight and so they escorted him until the gate. They forced him through a further two security checks in which they removed three of the bottles in his cabin bag he had bought from Greece, with a total loss of 25 euro. One would wonder why he had to go through security checks again, since he didn't leave the airport and he was checked at Thessaloniki airport. Especially since it was the security staff's decision to deny him entry. All this time I was on the other side, trying to call him and reassure him that I would find him at the gates. I also tried to reach the passport control desks, in case I could explain the situation to the officers and allow me to get his bags. The security staff was so rude and obnoxious towards me, I was shocked. The first lady repeatedly asked me to leave, while I was trying to explain to her that I am looking for my partner that was held back and that I wanted to clarify what happened to him. She just said, "no Sir you have to go". I stepped a few steps back and tried to call my partner to tell him that I had to go and I would see him on the other side, when a second even more obnoxious, security staff asked me once again to move on and get out the area. "Sir, I thought you were told to leave". Even though I was clearly not making any fuss, I was just on the phone trying to talk to my partner and explain to him that I cannot reach him at this point; he will have to do as he was told. I left and went to check the bag in, went through security again in which I was myself scanned twice, before meeting my partner. He described how terrible the whole situation was and how horrible they treated people with no EU passports. Before him there was a group of people from the USA, who were also refused entry in the UK, after only losing their flight back to their country. They were trying to reach the airline's desk, but the security staff were repeatedly telling them that they have to turn back. "Go back where", the passengers were asking, "our flight has departed!" The answer they got was "that is something that you and your airline will have to solve", before being escorted away like my partner. Can anyone imagine the frustration of these individuals? Being on one flight, losing their next one to the USA and not be able to get out from the arrivals to find a representative of their airline and solve the problem. How could they solve it while remaining in the arrivals area, while most airlines have their customer care desks at the departure sector? I have lodged a complaint with Manchester Airport, in which they advised me that the staff responsible were not airport employees, rather from the UK Border Agency, a government body. In other words, the country's recent policy was to deter any non-EU nationals from entering the UK briefly, unless their destination was their country. It is all due to the country's recent stricter border controls policy, in order to manage immigration, especially from countries like Greece, which has been on the forefront of Europe's refugee crisis. One can understand that all this unnecessary hysteria, shows a lack of competence to deal with the issue, a national insecurity about immigrants or refugees and not only in the UK but the whole of the Western world. A country like Britain that was so progressive in the past, has now turned so xenophobic that cannot allow a young man which has legally the right to visit the UK as a tourist visa free, to enter the country for some time while traveling from one EU member state to another. What terrifies me the most is what will happen after Brexit is completed and the country leaves the EU for good. Will this be a actuality for all travellers, either EU or non-EU that are unfortunate enough to pass through Britain in transit? This is the reality of stricter border controls, that many of you desired and voted for. Either in the UK, or in Austria, Hungary, Italy, Greece, Poland, France, the Netherlands and so on. This is the face of more "security," of customs checks, border controls, end of visa free travel and stricter immigration rules. I hope you are pleased with such outcome because if the Europe you want is one of stricter immigration controls, then this is how it looks like. Hopefully it will not be extended to all EU nationals later on. We need to appreciate what we have and enjoy in our continent and perhaps ponder; is our fear of immigrants actually so important, that we are willing to lose one of our biggest benefits as EU citizens? That of the freedom of movement.